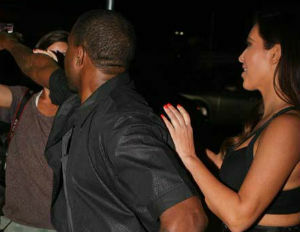 Rapper Kanye West’s tumultuous relationship with the paparazzi continues. The rapper shoved a Miami female photographer last night after she asked him a question about Reggie Bush, while he walking to dinner with his girlfriend Kim Kardashian. If you didn’t already know, Bush and Kardashian had a long relationship before she began to date her ex-husband Kris Humphries and current boyfriend Kanye West.